The new Des Moines Creek Business Park (DMCBP) is the $125 million redevelopment of a site that spent decades as a modern ghost town. For more than twenty years the site was an abandoned residential area containing nothing but exposed foundations and empty asphalt and concrete streets. The area is now home to K2 Sports, produce supplier Organically Grown Company, logistics company Meiko America, Inc., PODS moving and storage, convenience food producer Greencore, and Kardiel, a furniture manufacturer. These companies will be joined in early 2018 by 1,600 employees at the new Federal Aviation Administration (FAA) headquarters. Development of the DMCBP adds economic stability to the cities of Des Moines and SeaTac, creates 1.3 million square feet of state-of-the-art industrial/commercial facilities, and brings more than 6,000 jobs to the Des Moines/SeaTac area. Equally as important, the redevelopment also improves the water quality and fish and wildlife habitat in the watershed. Soundview Consultants LLC was an integral part of the redevelopment team for the DMCBP. Our wetland and environmental expertise was essential to meet the challenges of a site with several acres of environmentally sensitive areas and its proximity to steep slopes, and offsite wetlands and streams. The site’s varied and interesting history added its own challenges to this large scale commercial redevelopment. 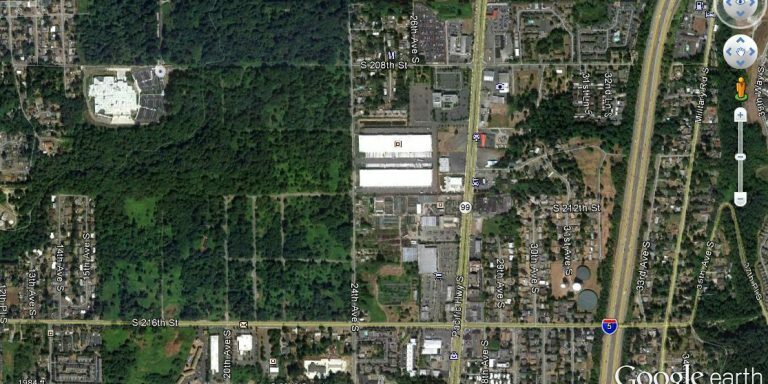 The Des Moines Creek Business Park (DMCBP) is an 87-acre site located south of the Seattle Tacoma International Airport. The site is bounded on the north by South 208th Street, to the east by 24th Avenue South, to the south by South 216th Street, and on the west by Des Moines Creek Park. At the turn of the twentieth century, the site was part of a larger forest management area. A United States Geological Survey (USGS) Land Classification Map from 1900 shows that land to the east of the site had been cleared of trees and the area’s infrastructure was developing – including the roads that would later become South 216th Street and 24th Avenue South. 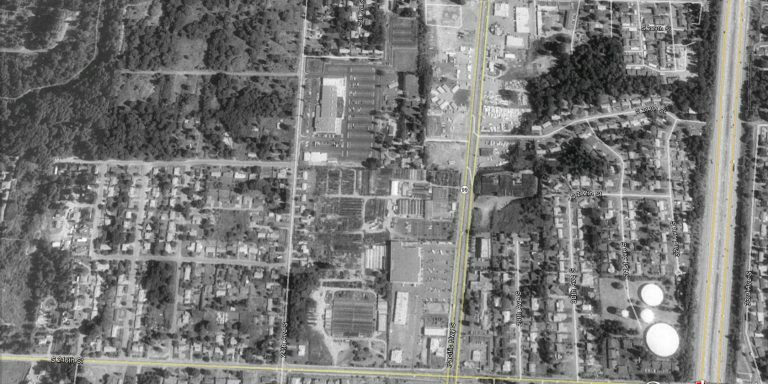 In the 1930’s, the area contained numerous small farms and businesses that catered to the many drivers traveling through the Des Moines area from Seattle to Tacoma on Pacific Highway South. 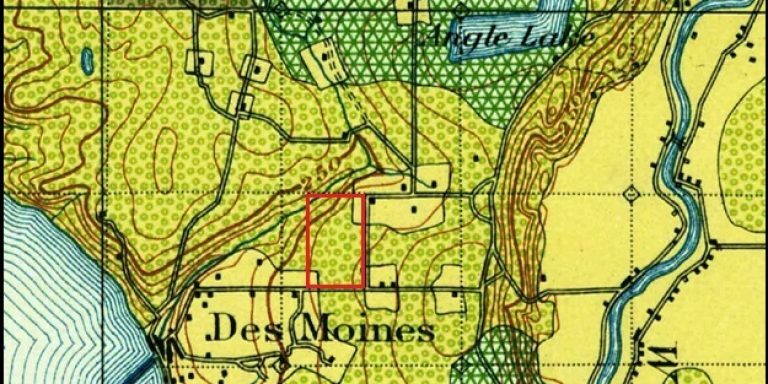 In this US Geological Survey Map from 1900, the Des Moines Creek Business Park site is shown as part of a larger forest management area. The “cut areas restocking” are indicated by the green dots and “cut areas not restocking” are indicated by the yellow areas. 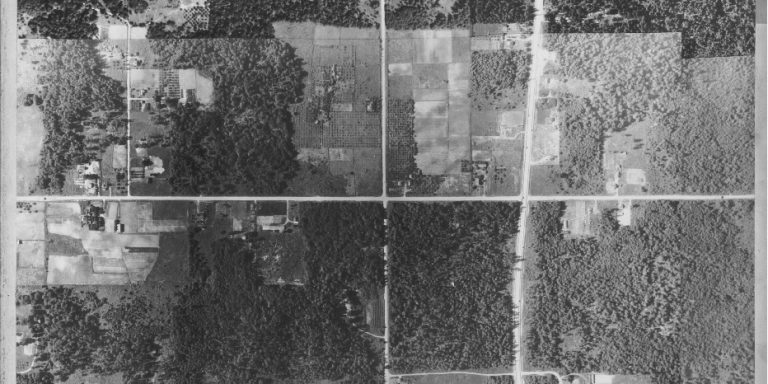 This aerial photo from 1937 shows the numerous small farms in the area. Pacific Highway South, the main road for travelers from Tacoma to Seattle, is the larger road on the right. The Japanese attack on Pearl Harbor in December 1941 brought the United States into a war in the Pacific. It also spurred great changes in the Des Moines/SeaTac area. Because of the war effort, local airports including Boeing Field in Seattle, McChord Field in Tacoma, and Bryn Mar Field in Renton were under the control of the US military for production of wartime bombers and for military flights. Another airport was needed to serve the public. The Port of Seattle settled on a 900-acre site near Bow Lake, just to the north of the DMCBP site, to construct the Seattle-Tacoma Airport. Construction of the airport began in January 1943 and the ceremonial “first landing” at the new airport took place in October 1944. After the war, the success of SeaTac airport led to increased commercial and residential growth in the area. The region just to the south of the airport was developed into residential neighborhoods. This aerial photograph from 1990 shows the residential neighborhoods that grew up in the shadow of Sea-Tac airport. The DMCBP site is on the left of this photograph, Pacific Highway S is in the middle right, and Interstate 5 is at the far right. The increase in airplane size and flight frequency led to further expansion at SeaTac Airport. In 1960, the main runway was lengthened 1,700 feet to the south and in 1967 construction started on a second north-south runway. In the early 1970’s, homeowners and school districts adjacent to the airport sued the Port of Seattle for damage to their properties from jet noise, vibration, and exhaust from take-offs and landings. The Port spent nearly $100 million dollars to buy nearly 2,000 homes in the area most affected by jet noise. The homes were vacated, the structures and most utilities were removed or abandoned, and just a few exposed foundations and abandoned asphalt and concrete residential streets were all that remained. 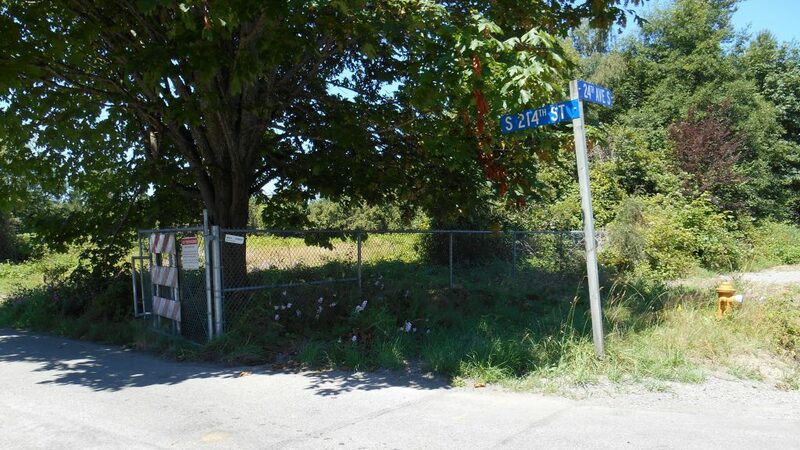 Over the years the property became overgrown with native landscape and invasive species and occasionally was partially grubbed to allow surveying, geotechnical, and environmental investigations. This aerial photograph from 2011 shows the DMCBP site before redevelopment. The area had been vacant for more than two decades. The remnant streets of the abandoned residential neighborhoods were all that remained. The site had all the qualities necessary for a successful redevelopment; it was large, level, vacant, centrally located, accessible to major highways and sea ports, and highly sought after. Several proposals for redevelopment were offered. In 1995, the site was the proposed location of the Des Moines Creek Technology Campus. In 2008, a developer from Southern California planned retail stores and a business park on the site but was unable to secure financing for the project. Puget Sound Energy planned to develop the site for its Central Operations Facility, but due to the economic downturn in 2012 the proposal did not come to fruition. Both the City of Des Moines and the Port of Seattle were eager for redevelopment of the site to bring jobs, income, and tax revenue to the area. Finally, after two decades of unsuccessful attempts to redevelop the site, the Port of Seattle selected Panattoni Development Company in 2013 to begin development of the DMCBP. The site began its rebirth to become an economic and environmental success story.